Although the purpose of Ancestry.com is to offer subscriptions to online data, the site also offers some good articles and video tutorials for free. The video tutorials cover topics such as Why Start a Family Tree and Exploring Census Records. The Learning Center provides free forms and charts, descriptions of historical record types (including census, military, and vital records), as well as advice on how to use the various resources on Ancestry.com. 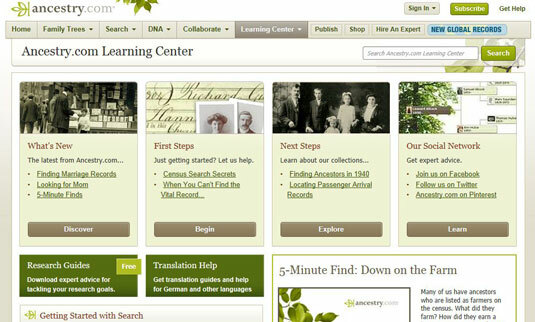 The FamilySearch Help Center contains several resources to help with your research. 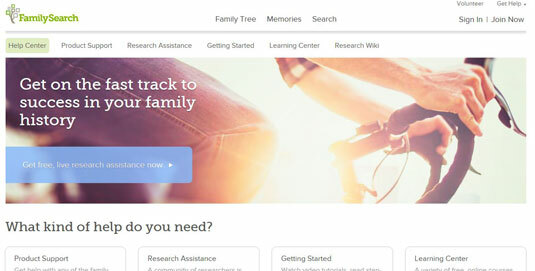 The Center covers support for FamilySearch products, live research assistance from individuals with expertise in particular areas, getting started tutorials, a learning center with online courses, and the FamilySearch Research Wiki. With more than 75,000 articles related to genealogical research, the FamilySearch Research Wiki is an invaluable guide to assist you with your research. Whether you’re looking for guidance on a specific locality, a type of record, or an ethnic group, or you need general help with research, you should be able to find an applicable article. The site is set up like a typical wiki and is maintained by the genealogical community at large. WeRelate started as a wiki developed jointly by the Foundation for On-Line Genealogy and the Allen County Public Library. It has recently added contributions from the user community, mostly in the form of pages on specific ancestors. It claims to be the largest genealogy wiki with ancestor pages numbering more than 2,500,000. 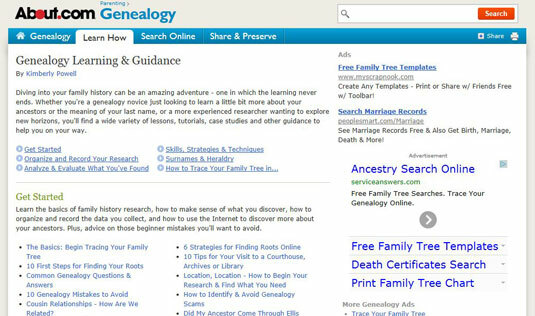 Genealogy Today’s Guide to Genealogy (located on the left side of the home page, near the bottom) contains tips for experienced and newbie researchers alike. The guide is divided into four categories: Getting Started, Family History, Research Tools, and Advanced Topics. Mixed with the articles are suggestions on how to use the site’s other resources to contribute to your research success. 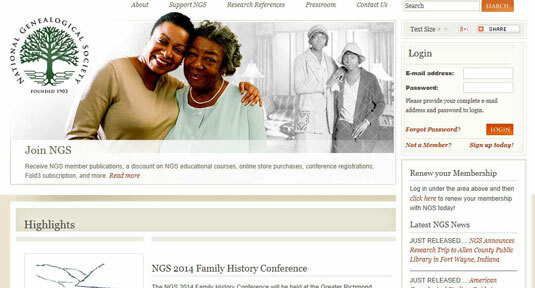 Under Advanced Topics, try the News Center link, which reports on new genealogical resources. If you’re looking for a concise overview of genealogical research methods, then the Guide to Family History Research may be for you. The site is divided into 13 topics. The GEN-NEWBIE-L mailing list is a forum for individuals who are new to computers and genealogy and are looking for a place to discuss a variety of topics in a comfortable environment. After you subscribe to the mailing list, you will receive a confirmation message with additional details on unsubscribing from the mailing list (if you want to do so down the road) and other administrative items. If you have questions about the mailing list, consult the GEN-NEWBIE-L home page for help. If you’ve asked questions, you can search the archives of the mailing list from the mailing list’s home page to see whether your questions have been answered. The National Genealogical Society (NGS) is an organization for individuals whose research interests include the United States. At its website, you can find information on the society’s home-study genealogy course, online and PDF courses, how to start your genealogy research, research services, the society’s library catalog, and conferences. The site also has information about membership — no surprise there — and does a good job of keeping visitors abreast of genealogical news and events. You even find a bookstore that carries a lot more than just books on its virtual shelves. On the site is a free online Family History Skills course available to its members. ProGenealogists is a professional genealogical research firm. It provides a number of research services, for a fee, and it can access records and researchers from around the world. In addition to providing research services, ProGenealogists has posted several resources, including a list of links to online databases, how-to articles, a citation guide, resources related to specific countries, blank forms, lists of journals and magazines, genealogy news, and research tools. 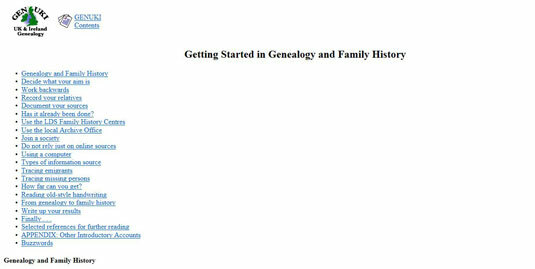 The GENUKI (U.K. and Ireland Genealogy) website provides a list of helpful hints for starting out in genealogical research. The extensive list covers the following elements and more: deciding the aim of your research, using Family History Centers, joining a genealogical society, tracing immigrants, and organizing your information. You also find a list of reference materials — should you want to read more about the topics GENUKI discusses. If you’re looking for information on a range of genealogical topics, hop over to the About.com Genealogy site. The Genealogy Learning and Guidance section has a large collection of articles categorized by subject. You find many subcategories under each of these topics as well. Some of the resources in these categories include information on surname origins, mistakes you can avoid, a genealogy chat room, and publishing your family history.